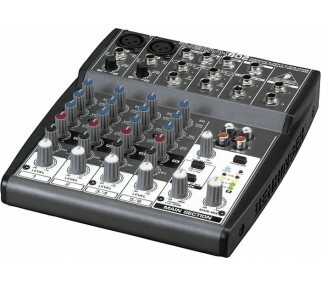 Rent this small audio mixer to connect several audio input sources into a pair of speakers and individually control volume levels and sound quality. 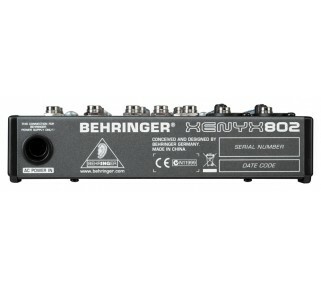 This Behringer Xenyx 802 has 2 XLR or 1/4" inputs (typically used for wired or wireless microphones), 2 1/4" stereo inputs (for iPod, CD Player or PC audio input), and separate RCA tape inputs. 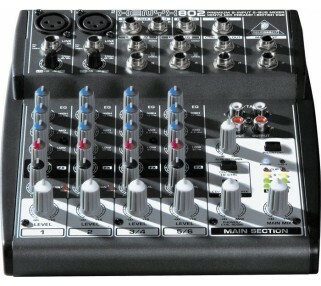 A 3-band equalizer on the 4 primary inputs lets you fine tune sound quality.